The BERNINA 500E is the embroidery-only model of the NEW BERNINA 5-Series launching in 2017. 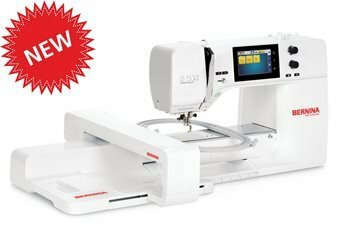 The new BERNINA 500E features more throat space + jumbo bobbin + pinpoint embroidery placement + countless other embroidery features. The new 500E offers 275 built-in embroidery designs and eight embroidery alphabets. Place your design exactly on the fabric with the built-in functionality Pinpoint Placement. These are just a few of the features that make the BERNINA 500 stand out among the competition. The BERNINA 500 is an intuitive and easy to use embroidery machine. If you love creating things with no limits, this is a great machine for you.